These stories represent our place at Riccarton High School. They were designed by a Friend of the school (Gavin Britt) in consultation with the students of Te Reo, the Māori students, the Kapahaka students and whomever else Gavin would bully into turning up. 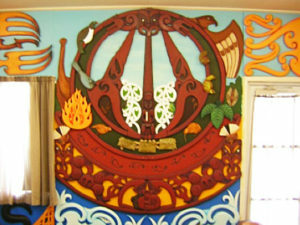 Initially, he came to Te Reo classes and together with the students, they planned the stories which needed to be told. Together, they designed panels which would fit the new whare, deciding on the content, the patterns, shapes and colours. While Gavin did much of the designing, the students were responsible for drawing, cutting, painting and positioning the shapes. As the project gathered momentum, students would arrive early at school to work on their carvings. Even now, there is still room to add more detail – this story of Putaringamotu is still developing. This panel took ages to complete. The story was clear – the development of Te Wai Pounamu, the South Island – but the students were not focussed. Finally, Gavin told them one morning that if they didn’t finish it that day it would be a window, and before interval, the lads had completed the maunga and were designing the stars. Look at the carvings of the lords on the up-turned waka. Can you see the 7 stars of Mataariki above, and the waves against the land below? In the days of old, Maui and his brothers set out in this waka to return to the heavens. But, because they neglected the appropriate karakia, an enormous storm blew up which forced the waka against a reef. It capsized, spilling its contents out to make the Canterbury plains. See how the brothers have climbed up onto the up-turned waka. In the face of the storm, they can do nothing. Helpless, they huddle together and sing. See the carvings at the top? They speak of the waiata the brothers sang – of the tini roimata, the tears of love, of hope, of fear, of pain, of regret. Of the four winds which blow around them. Of the passage of the stars, from the birth of the year at Mataariki, and the ways the people follow in the wake of the waka, the long sail from Hawaiikiroa to Aotearoa. So they sang, singing into existence the waiata of Ngai Tahu. And so they waited as the storm crashed around, through centuries and decades, until finally they were turned to stone. The tallest, Aoraki, has become the centre of the Southern Alps, the tallest maunga of Aotearoa, and stands till this day, his brothers around him, forming the backbone of Te Waipounamu, Te Waka-a-Maui. 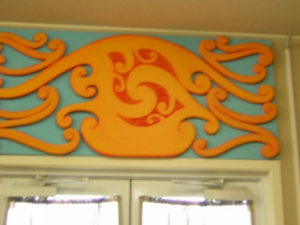 Because our Riccarton whanau come from all over Aotearoa, this panel represents the creation of the North Island, te ika a Maui. See the great wheke in the Southern Ocean? Can you see also the dolphins and whale which accompany him? 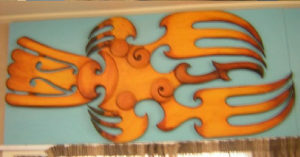 The people from Hawaiikiroa followed the whale in their waka, at their same speed, following the food trails of fish, until they came to this ocean. See the jawbone of Maui, which he used to catch the great wheke? Look at the sea from which the huge fish emerged. Here you see the Pouakai, the great eagle, which used to sweep across the forests of the great plains, which hunted the moa and other large birds, which carried off careless animals and unwary children. Up to 100 years since the people arrived, this eagle lived on the heights above the forests. There was a colony on the Port Hills many years ago, where these magnificent birds bred and hunted. There are places on the summit road where travellers, passing over the port hills took shelter in marked overhangs and caves, so that their children would be protected from these predators. Its great wing span allowed it to appear suddenly and swoop down on its unsuspecting prey. This bird too, like the moa he hunted, has vanished. He no longer rides the upper currents of the sky to drop like an arrow on his prey. He exists now only in tribal memory and the stories handed down form our ancestors. This land was rich, abundant land – teeming with resources. The sea itself was particularly full and provided a never-ending source of food for the people. 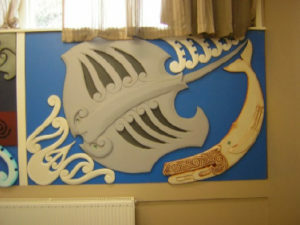 This panel shows the fish which swam in nearby Lake Ellesmere, Te Waihora. The river which wound from the hills out to the sea was filled with eels, and the estuary was a rich sources of many kinds of fish. See the net patterns which surround them. And remember the wealth that we are now struggling to protect. Te Kete Ika o Rākaihautū means the food basket of Rākaihautū. Rākaihautū was a legendary ancestor who helped form the landscape of the area. The atua (God) which guarded the lake was Tūterakiwhānoa. A protective taniwha, he preserved the lake and its food sources. It was extremely important that Māori avoid angering this atua least he take revenge and so, a deep respect of food gathering protocols was vital. The food sources of Te Waihora were once abundant and included tuna (eels), pātiki (flounder) and aua (mullet). Te Waihora was a famed mahinga manu wai māori (place for taking waterfowl). Sadly, today the richness of Waihora as a mahinga kai has been largely sacrificed to farmland. While it remains a mahinga kai, its yields have been significantly reduced due to the periodic drainage of the lake in order to maintain reclaimed land and pasture. This is the panel of Putaringamotu – this is the panel of our stories. In the days of old, this area was a swamp, surrounded by native forest, of which all that is left is the small enclave of Riccarton Bush. See the man below, with his ear to the ground? “taringa” is the Maori word for “ears”, “motu” the word for “island”, and the swamp was a good surface to throw back the sound of approaching feet. By listening to the ground, you could tell when people were coming. Here, he is supported by his ancestors, his whanau, who listen with him. See the footsteps above him? He is listening for them, but they also represent the footsteps of all those who have passed this way, who have moved through this land, who have taught and learnt at this school, who have created these panels. See the trees and the carvings of the forest creatures – the birds and insects, the moths which filled the bush – can you see the spider’s web up in the top corner? See the green leaves and the koru patterns which show growth and development. Can you see the fire which burnt the bush, leaving only the small circle which remains even now, and is being developed to bring back the kiwi which used to browse there. Now look at the figure in the middle, wearing around neck the koauau. This is the Riccarton student. See how the student is shown by a tree, the kahikatea, so that you will grow straight and strong like it has. See the two trees which lean in to support you? These represent your own support network, your whānau behind you, your teachers who encourage you and support you to learn. See how the student stands on the three baskets, the three kete of learning – nga kete ipurangi. Maui went to a lot of trouble to get them for you – what do you know about them? You can see they form the base on which the student stands. What is in them? What essential learning will you need? See, too, how the student stands firmly in the turangawaewae of Putaringamotu. The tupuna lean in to support him, he is part of the world around him, part of the natural world which contains the birds, moths, insects, plants and even the waters which flow invisibly beneath the earth. Look at the sun over the doorway. See how the rays reflect the light through the entrance. Look at the poutama, the steps in the glass which lead up to the light, up to knowledge and learning. See in the carving of the sun the patterns made by Maui’s ropes when he held back time so we could use the full day usefully. This was the artist carver’s favorite panel. See how it shows all the springs of water we enjoy – the sources of salt water from the sea, the springs of cool, fresh water, and the hot water springs, all gifts from the land. 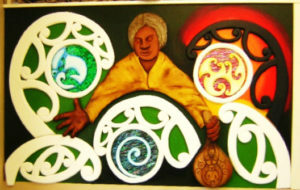 Look at the woman who offers them, holding the gourd which contains the water of life, te wairua. 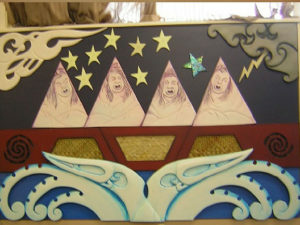 For Gavin Britt, who designed this panel, she is both Hine-tītama , the Goddess of the dawn and mother of Maui, and Hine-nui-te-po, the Goddess of night and of death, who caused him to die. She also represents all women who give and support life, and especially the wahine, the kuia, who pass on these stories, who remember and hold and pass on the korero o nehera. This is the panel the students most enjoyed designing and creating. 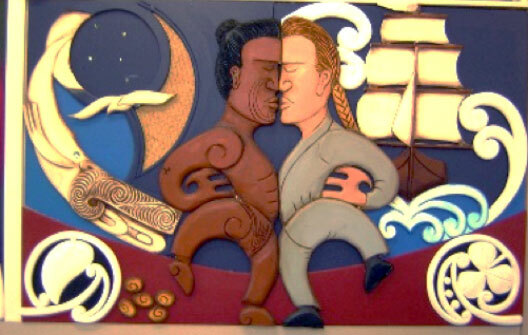 It represents the meeting of Pakeha and Māori, in a traditional hongi. See how the Māori side shows the moon and Southern Cross, the star signs which guided the great fleet to Aotearoa, and the sail of the waka, constructed in harakeke. They followed the albatross and the whale, te toroa and te tohora. On the right, the carvings show the boats which the Pakeha navigated to arrive in Aotearoa. While the carvings show a chief and a representative of Captain Cook, they also represent all Māori, all Pakeha, arriving in Aotearoa, all of us immigrants, all of us meeting each other and making our first contact. Look at the bottom corners of this panel. The students wanted to show what each bought to the new land. 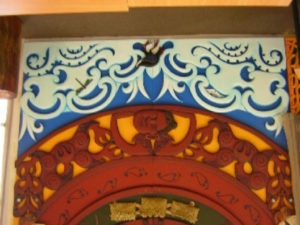 On the left, you see the seeds and curled vine of the sweet yam, which the Māori brought in their waka from Hawaiikiroa. On the right, the plant chosen to represent the Pakeha’s gift is the clover – (gorse was considered and discarded, because it was not a positive import!) What would you have chosen?